Precipitation Hardening, also called Age Hardening, is used to increase the yield strength of specific materials. Hardness of the materials is also increased. Use Precipitation Age Hardening to harden Maraging steel or other metals such as Aluminium Alloy. Materials suitable for precipitation hardening are often specifically designed - such as Maraging Steel or PH Steel. 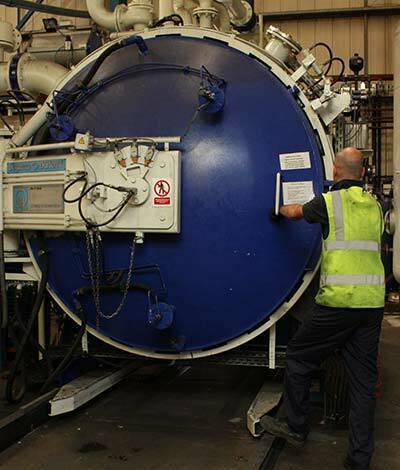 This is process delivers excellent results for annealing aluminium and hardening PH Steel. Parts to be treated are initially machined in the soft (solution treated) condition before precipitation hardened at relatively low temperatures to produce the required properties. Different conditions can be achieved by changing the time and temperature of the precipitation hardening treatment. Precipitation age hardening is a successful heat treatment for 17-4ph steel, and 15-5ph steel. Please contact your local Hauck HT plant for further information on Precipitation Hardening.